The death toll from the massive earthquake and tsunami that hit Japan Friday is likely to top 10,000, The Associated Press reported Sunday, while the government scrambled to avert a deepening crisis at nuclear plants damaged in the disaster. Possible partial meltdowns are presumed at two nuclear reactors, and four more are having serious cooling problems, the New York Times reported. More than 170,000 people have evacuated areas around nuclear plants to avoid possible radioactive contamination. Prime Minister Naoto Kan said Sunday in an address to the nation that the earthquake, tsunami and the nuclear emergency are the biggest challenge the country has faced since World War II. “In the 65 years after the end of World War II, this is the toughest and the most difficult crisis for Japan,” he said. On Saturday, operators took the drastic measure of flooding one of the units at the Fukushima Dai-ichi nuclear complex with seawater in an attempt to prevent a meltdown, following an explosion on the unit. Chief Cabinet Secretary Yukio Edano said Sunday a second unit at the same facility was a threat for a hydrogen explosion. “At the risk of raising further public concern, we cannot rule out the possibility of an explosion,” Edano said. So far no reactors have seen complete meltdowns, which would release uranium and other contaminants into the environment, but the emergency already appears to be the worst crisis at a nuclear plant since the Chernobyl disaster 25 years ago, said the Times. Authorities have set up a perimeter around the Fukushima Dai-ichi plant, and said the amount of radiation released by the explosion there Saturday appears to be relatively low. However, workers at evacuation centers are scanning people for radiation exposure and 160 people may have been exposed to radiation so far, reported the Washington Post. 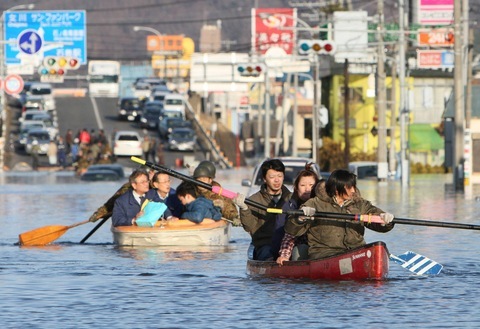 Meanwhile on the northeastern coast of the country, the area hardest hit by the quake and tsunami, the fears of contamination came as rescue efforts continued and workers pulled bodies from homes crushed in the wall of water that hit the coastal areas. Almost 2 million households are without power in the north, where temperatures have plummeted, and about 1.4 million are without running water, said the government. 5:10 p.m. ET Update: | A 60-year-old man was rescued Sunday after spending two days at sea, floating on the roof of his home. Japanese troops spotted him waving a red cloth and picked him up by boat.